CES may be finished for another year, but one of the biggest themes of the show — that anything (cars, watches, mirrors, tables, whatever) can be ‘hardware’ — is just taking off. And today’s news of Google buying Nest for $3.2 billion underscores how Google wants to be the player at the front and center of hardware. Google’s Nest buy may not be giving the search giant access to all the data that zooms across Nest’s apps, thermostats and smoke detectors (for now at least), but it will give Google something else: top-shelf design expertise for that next frontier of hardware, by way of a team of people brought together by two senior hardware veterans from Apple, one of whom is known as the father of the iPod. This is a significant turn of events for Google. Up to now, the search giant has cornered business — on desktop internet, mobile devices — through software, and then monetized those markets with data — specifically advertising data. Nest will give Google an opportunity to diversify its revenues by tackling a whole new market — connected home devices — with that vertical approach. 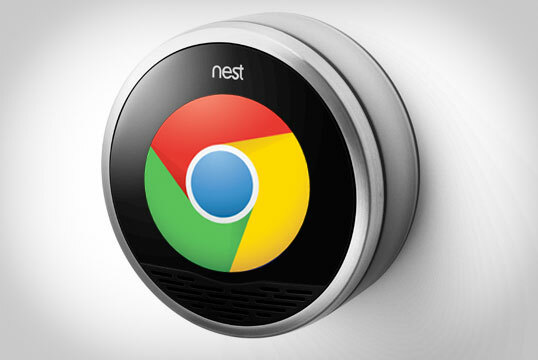 For Google, Nest is a particularly attractive example. Not only does it make an integrated piece of connected hardware for the home, but it’s designed with interoperability at its heart — in the initial case, by way of apps that you control on your iOS or Android smartphone, along with a well-developed, direct and online retail channel and loyal following. It’s an area, in any case, that Google appears to have already been eyeing up for some time. In December, for example, The Information uncovered a test Google was running called EnergySense, which appeared to be a smart thermostat program that helped people lower energy consumption. This reportedly was being trialled on third party devices from Nest competitor Ecobee, but could now potentially find their way to Nest’s thermostats instead. “Will Nest and Google products work with each other?” co-founder Matt Rogers asked in a hypothetical Q&A post earlier today. “Nest’s product line obviously caught the attention of Google and I’m betting that there’s a lot of cool stuff we could do together, but nothing to share today,” he answered. Yet, to say that the acquisition is a boost for Google alone is not the whole story. For months now, Nest has been facing a growing cacophony of criticism from customers that the software on its products was buggy. Leaning on Google’s software expertise could come in handy here (although the overlap between Google haters and Nest lovers could pose a problem in this regard). And there is also the issue of Nest’s intellectual property and patent fights. Nest is facing patent infringement lawsuits from Honeywell and First Alert maker BRK. To help fight those and also to protect itself from copycats, it’s been aggressive on the patent front, with 100 patents granted, another 200 filed and a further 200 ready to file; and an ongoing licensing agreement with Intellectual Ventures. Bringing Google into the mix will be another major boost for safeguarding the company in these battles, too. The Nest acquisition also raises questions of how Google’s other hardware interests may come into play going forward. Motorola, which Google acquired for $12.5 billion in 2012, at one time looked like it could be a way for Google to take a new, vertical approach to smartphones and tablets. Ultimately, Motorola remained a partner among equals with other Android OEMs, and patents became one of the most crucial parts of the deal. Could the Nest acquisition, bringing a new focus on hardware creation, see Google bring in some of the IP and talent that Google picked up in that Motorola deal?